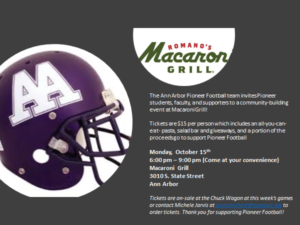 The Ann Arbor Pioneer Football team invites Pioneer students, faculty and supporters to a community-building event at Macaroni Grill! Tickets are $15 per person which includes an all-you-can-eat pasta, salad bar and giveaways, and a portion of the proceeds go to support Pioneer Football. Tickets are on sale at the Chuck Wagon at this week’s games, or contact Michele Jarvis at jarvismichele@comcast.net to order tickets. Thank you for supporting Pioneer Football!